This area covers the Chilterns dipslope behind the Escarpment, covers an area of BAP priority beech and yew and mixed deciduous woodlands. This BOA connects with the Chiltern Escarpment BOA. Geology: Chalk overlain by clay with flints on the higher ground. Topography: The Chiltern dipslope sloping gently away from the top of the Chilterns Ridge. 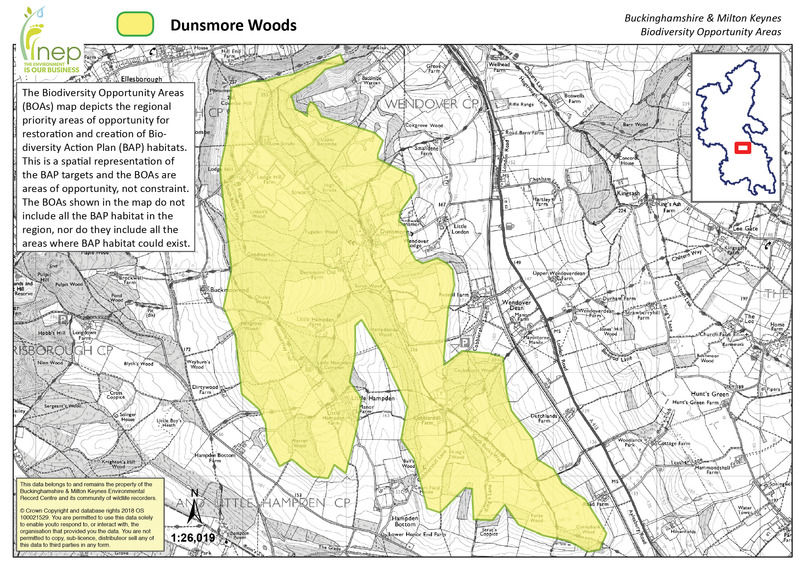 Woodland –There are 6 woodland LWSs in the area. Lowland Heathland – There is an area of lowland heathland at the top of Coombe Hill, within Bacombe and Coombe Hills SSSI. Hedgerows –There are 3 green lane/ hedgerow LWSs in the south of the area. Arable Field Margins – There are several arable fields in the area and the Chilterns is a Plant life priority area for rare arable plants. National Trust owns Coombe Hill and Low Scrub.